For other uses, see West (disambiguation). 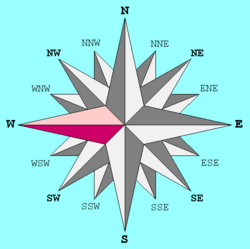 West is one of the 4 main directions on a compass. West is normally to the left on most maps. Iran is west of Afghanistan. Thailand is west of Vietnam. Greece is west of Turkey. The sun and moon set in the west. West Facts for Kids. Kiddle Encyclopedia.